I have way too many worms in my Can O Worms. It seems no matter how much I feed them, I can’t get them to all come up and it is WAY too many worms to sort through. My bin is getting really loaded and the worms on top are composting so fast I will need to start another tray soon. Is there anything I can do to harvest the worms from my bin? I know I am replying to a very old post, but I am very passionate about worms and this broke my heart. First of all, too many worms..means you are a excellant worm farmer!, This is not a problem!! If your red wigglers are mating, then you are doing something right!! Keep it up. 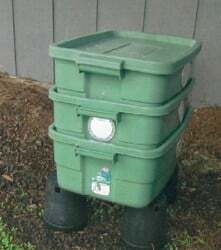 Now just because you do not have a Fancy Dancy Worm Bin that cost a pretty penny when you grow out of the can -o-worms or another bin you paid for dont give up and act like it is a problem. Sure pass some to your neighbors if it is too much to handle. really, Come on…If you are vermicomposting then I am sure you are one that likes to use your resources. Use anything and everything for a worm bin…doesnt have to be fancy…When it comes down to it, the red worms do not really care if it is a bucket, box, or a dresser drawer. There is a blog I have ran across, that has some unquie ideas on making a worm farm with materials you probaly already own. Check it out and happy worm farming y’all! There are several methods for harvesting worms or castings from your bin. 1.) Dump the bin’s contents out and then manually separate the worms from the compost. 2.) Move everything to one side and place some food on the other side. Replace the lid and come back in a week or so. During that time, the worms should migrate over to the new food. 3.) Bury a bag full of food inside your bin — the bag must have holes large enough for worms to enter — and leave it for a couple days. Pull the bag out and separate your worms. I’ve included a link that should help. Scroll down to “Cleaning and Harvesting” for more information.